The entire village of Mu'l'lik-ku'lam with its fertile lands, at least 7 irrigation tanks and a thriving fishing infrastructure has been under SL military occupation for 10 years since 2007. Tamil villagers were having at least 200 cement houses, a school, church, temple and a multi-purpose cooperative society, says 75-year-old Tamil fisherman Antony Lambert, who is one of the uprooted Tamils waging a continuous struggle for the last 12 days. All the houses except the few numbering between 27 and 30 have been destroyed by the military, he says. After languishing at different places for more than 4 years, a section of the people went back to Malang-kaadu, a jungle locality near Mu'l'li-ku'lam with a resolve to get back to their fertile village and they were braving military threats. Now, they are resolved to continue the fight to the end, says 63-year-old mother Anthoniya Vaz Sinnappu. 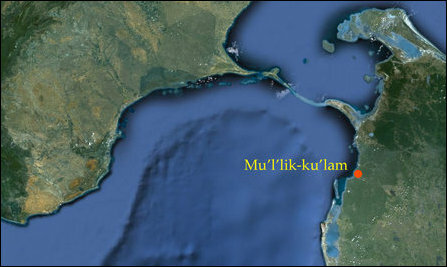 Mu'l'lik-ku'lam was one of the first targets of the occupying SL Army in the genocidal onslaught on Vanni launched in 2007 with the backing of global powers and the support of the regional power India. “SL Army said [in September 2007] that they were on a ‘clearing mission’ and that we will be allowed to come back to our village in three days. We left everything and walked. Later, we were taken to Murungkan school and were held there for one month. After that the SL military said we should seek shelter with friends and relatives elsewhere,” Ms Sinnappu said. Mr Lambert said the SL regime was trying to deceive the villagers with housing schemes and 0.5 acres of lands for each family elsewhere and that too after several years of their continued fight. But, none of these ‘compensations’ have restored their lost livelihood in Mu'l'lik-ku'lam. 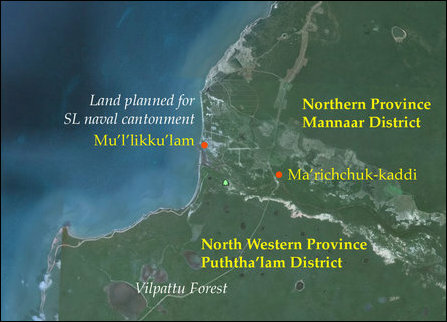 The occupying SL Navy transformed the entire village into the Command Headquarters of the so-called “North Western Naval Area” after it received the lands from the SL Army in 2008. The Sinhala Catholic Archbishop in Colombo and Vatican’s Cardinal Malcom Ranjit was backing Gotabhaya Rajapaksa, who was trying to deceive the people of Mu’l’lik-ku’lam in 2013 promising alternative lands. 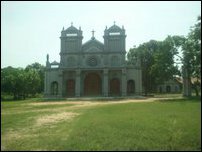 But, the Tamil Catholic people were firm in stating that nothing would compensate their loss. “It was after 4 years of hardships at displaced places such as Vaazhakkaip-paddaang-ka'ndal, Thaazhvu, Keeri, Peasaalai and Thalai-mannaar, we decided to occupy Malang-kaadu, a jungle area located near Mu'l'lik-ku'lam. SL military was opposing and threatening us. But we were determined to stay at Malangkaadu,” Ms Sinnappu told TamilNet. The uprooted protesters are planning to step up their struggle in the following weeks with rotational hunger-strikes. 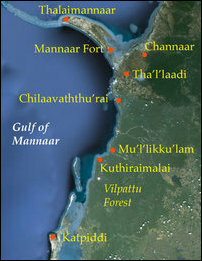 Mu'l'likku'lam, bordering Puththa'lam district is located in 46 km south of Mannaar town and 20 km south of Chilaavaththu'rai. 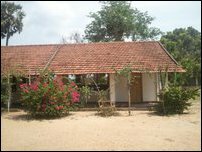 It has become a strategic point of occupation to the SL military that aim to Sinhalicise and colonise the land and the historic waters of Eezham Tamils.